Simplifying the query: Can we display the Note Text for any record (for instance, Customer Note, Vendor Note, Item Note, etc…) on a standard GP report? If so how? Challenge: We are left with only Report Modifier. No new table relationship can be defined. No VBA. No user-defined RW Functions. Then came David’s reply to the same post. He sent us a link from his blog, which explains Built-In RW Functions which can be used for many default requirements. Getting Note Text is one of them. That’s my starting point to explore this. Solution: Below is the step by step instruction on how we can achieve this, with limited customization tool options, but with abundant Built-In RW Functions. I have modified the Detailed Item List (Run from Item Maintenance Print Button) for the sample. This sample works with Dynamics GP 10.0. 1. Open the report from Report Modifier (or click on Modify from the Report Window). 3. 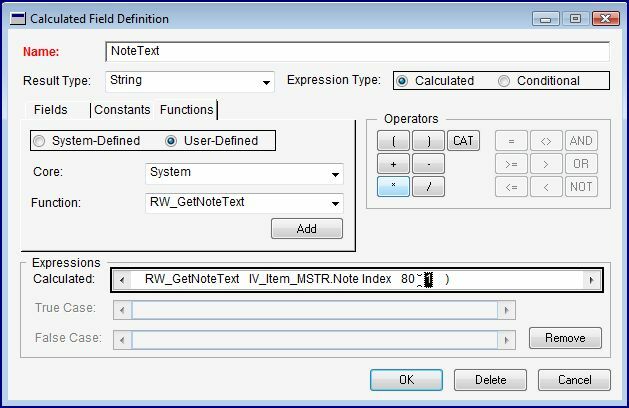 The Built-In RW function is RW_GetNoteText() and the Series is System. 4. 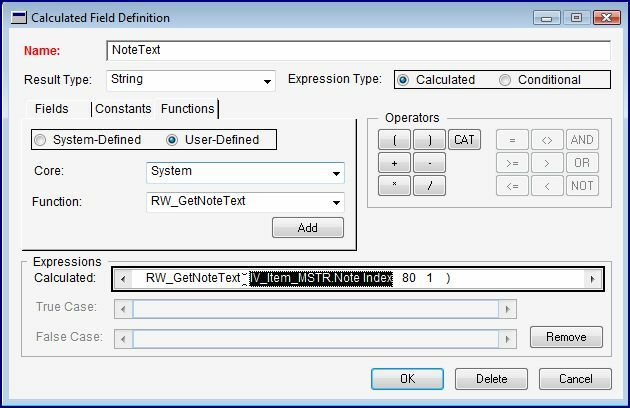 The first parameter is the Note Index value, which is in my case, Item’s Note Index stored in IV_Item_MSTR table. 5. The second parameter is the Number of Characters which is suppose to be shown in one line. The maximum number of characters is 80. 6. The third and final parameter is the Line Number. This instructs the function to get the first set of chars, second set of chars and so on, depending on the Line Number value. 7. On the whole, from my sample definition, it is going to show me the First 80 Characters in the Item Note Text. Add this Calculated Field anywhere on your report, of course on a more relevant place. To see the sample that I have developed, please visit this link and download the package file: Using Built-In RW Function to Display Note Text on a Report. Inspired by David’s Article: Using the Built-In Report Writer Functions. Thanks for this post… It was very helpful! Vaidy, this is a helpful post, but does it work for Project Accounting? I’m trying to pull notes from the Billing Master Notes Index to a Project Accounting billing format, but the notes are blank. Any ideas? What if I’m using another sap like crystal reports. how do I get the note index to print my notes. Stuck. 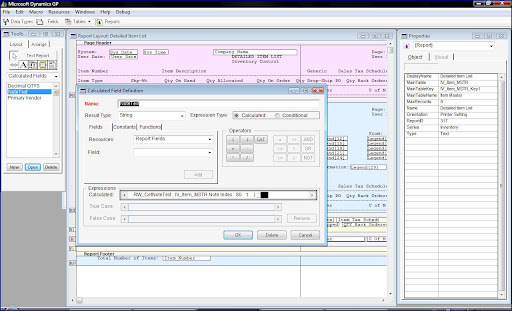 You will need to link the table SY03900 (Notes Master) with whatever table that you have as main table on your crystal report. For instance, if your report is from SOP10100 (SOP Transaction Work Header), then you can link the field NOTEINDX in SOP10100 with NOTEINDX in table SY3900. The field TXTFIELD in SY03900 will have the note text that you are looking for. Thank you so much for responding. I will try as soon as I get back to the office. This will work because it just makes so much sense. This does work for Project Accounting as well! I tested with a project note and added it to various PA reports. 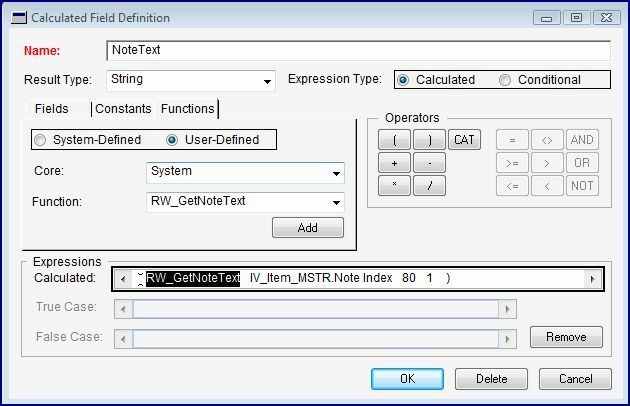 Linked this RW_GetNote Text function to the PA Project Master table > Project Note Index field and followed the remaining instructions above. Thanks so much, just used this today.